It’s time for your business to look & sound more professional. It’s time your business looks & sounds professional. Add a business phone number to any phone. Create a professional image by adding a separate local or toll free business number to your existing home, office, or cell phone. Make outbound calls from your cell phone that displays your business number as your caller ID. Create a professional image by adding a separate local or toll free business number to your existing home, office, or cell phone. Make outbound calls from that displays your business number as your caller ID. Impress customers with a professional greeting. Sound professional when your customers call your business number with a custom greeting and voice menu options. Keep your business running after hours with a special greeting, call forwarding, and business voicemail. Know who is calling & never miss a call. Know when it’s a customer calling, so you can answer professionally. Can’t take the call? Forward your business calls to a colleague, or send the caller to a professional unavailable greeting and company voicemail. Now you’re free to work from wherever you choose. Take business calls on any phone. Give everyone on your team their own extension. Create department and employee extensions that ring multiple phones in any order and forward anywhere: home, office, or cell phones. 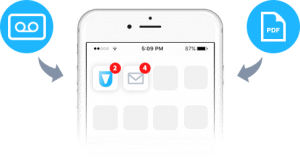 Receive voicemail & faxes via email or app. Get email and smartphone app notifications when new faxes or voicemail arrive. Just tap your notification to listen to voicemail or read a fax. Easily send faxes online, no fax machine required. No phone system equipment needed. UniTel Voice works with your existing cell, home, or office phones so you never have to purchase, install, or maintain expensive business phone system hardware. It’s all virtual. Setting up your phone system couldn’t be simpler. Pick a new local or toll free number, or keep your existing number and use it with UniTel Voice. Record or upload a greeting yourself, or use our free voice talent studio to record a greeting for you. Set up your call forwarding to route callers to the proper extensions, phones, or voicemail. Start receiving calls, voicemail, and faxes on any device, anywhere you go. What makes UniTel Voice different? All plans include the same amazing features & support, the only difference is the minutes. Record greetings and voicemail yourself or have one of our human voice talents do it for you. Set things up yourself in minutes, or if you’d like, we’ll do it for you over the phone at no cost. You own your numbers, no strings attached. Port them to another carrier anytime at no cost. Go ahead, get out your checklist of must-have features! Give your business instant credibility and a nationwide presence with a toll free phone number from any toll free number area code: 888, 877, 866, 855, 844, or the new hot 833 toll free number just released. Give your business a local presence in multiple locations by using a Chicago, Los Angeles, New York, and/or Miami phone number, for example. We have numbers available in almost every area code in North America. Also referred to as a virtual receptionist, auto-receptionist, virtual PBX or cloud PBX, your virtual auto attendant greets callers and routes them to the proper extensions, phones, or voicemail. It’s managed completely online. When you answer a call, your virtual phone system will announce to you which extension the caller selected. That way, you can answer the call professionally, or send them straight to your company voicemail. On-hold music or a custom message keeps your callers engaged while they are being forward or transferred to an extension. You can also upload a recording advertising your business's products and services. Our system does not restrict the number of concurrent calls that you can receive. If the phones where you are forwarding are busy, the system will detect that and send the caller to an unavailable voicemail greeting, no busy signals ever. 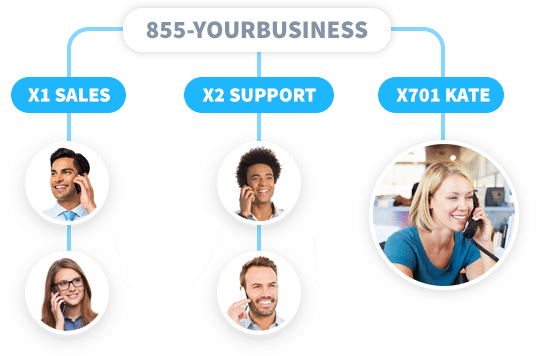 Give everyone on your team their own employee extension and set up department extensions to ring multiple phones in a flexible structure to connect staff working from multiple locations. 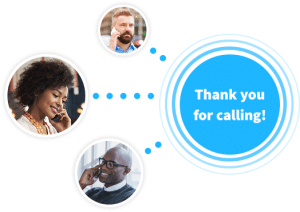 Use this advance call forwarding feature to connect up to three other phone lines, including home, mobile, or office numbers. With UniTel Voice your customers can reach you wherever you are. 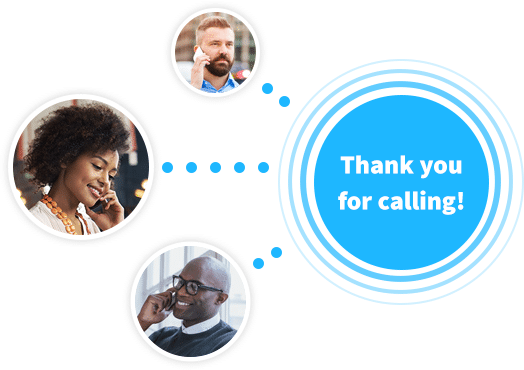 With call forwarding, you and your employees can be reached on virtually any telephone in the world whether on your cell, in the office, or at home. You can ring multiple phones in any order, anywhere. Call scheduling (or After-hours mode) lets your callers hear your custom main greeting when you're open, and an alternate greeting after hours. You can customize your hours of business for every day of the week. Never close your business again. We'll give your business a polished image with a professionally recorded greeting from our Voice Talent Studio. After all, first impressions are everything. And we don't use robots. We use human voice talents that read into a microphone. You can access your UniTel Voice account from any browser with your username and secure password. Since you manage your virtual phone system online, you can make changes in real time, no software or hardware is required. Your virtual phone system allows you to make outbound calls that display your company's caller ID. That way you can keep your personal cell phone number private and look more professional when making outbound calls. With UniTel Voice every number on your phone system doubles as a fax line. Your customers can call or fax your number. You receive incoming faxes as an email PDF attachment and you send faxes by logging into your account. Miss a call? Have your voicemails sent to your email inbox and/or smartphone app. You can also log into your account and view your complete call logs: missed calls, voicemail, faxes etc. A Dial-by-Name Directory is a feature commonly used by large company phone systems. Available with UniTel Voice, callers may use their keypad to find an employee by his/her last name when they do not know the specific extension. Call Logs track the phone calls you make and receive using your UniTel Voice business numbers. With Call Logs, you can keep a record of all your inbound and outbound calls to better understand your customer interactions and touchpoints. If you receive unwanted phone calls, you can avoid the hassle and wasted time of dealing with them by creating a blocked numbers list within your UniTel Voice online management portal. With caller ID you can identify callers before you answer the phone. You also have the ability to display the extension the inbound call came in on and the ability to change your outbound caller ID to display your business number. The UniTel Voice smartphone app makes running your business easier. 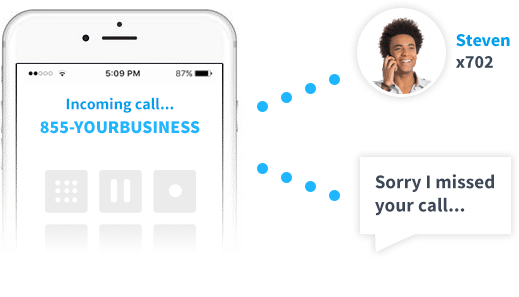 You can make outbound calls from your business line, put callers on hold, and receive notifications from miss calls, voicemails, and faxes. Works best with a strong Wi-Fi connection. When you answer a call on the UniTel Voice smartphone app, you can place the caller on hold and transfer them to any extension or number. You also have the ability to blind transfer the caller or use assisted transfer to make sure the call is answered. Within the UniTel Voice smartphone app, you can merge a third person into a two-way conversation. This 3-way calling feature can help you stay productive when you need to conference in another party. Receive a push notifications from the UniTel Voice App when you miss a call. Within the app, you can also see all your recently dialed calls and missed calls so you can quickly get back to customers and prospects. Do Not Disturb sends incoming calls straight to voicemail without ringing your phone. UniTel Voice also allows you to read a transcription of any voicemail so you can stay in the loop, even when you're too busy to talk. You can make and receive calls using your WiFi network with the UniTel Voice iPhone or Android app. This is great if you work in an area with a bad network connection, or don't want to waste cellular data to conduct business. A custom phone greeting is a recording that plays automatically when a customer calls. They can be set to play right at the start as a professional welcome, as a voicemail greeting, or even as an away message when you can’t answer. The after-hours greeting is what callers hear when they reach your business after it has closed. You can record your after-hours greeting yourself or have one professionally recorded using UniTel Voice's free Voice Talent Studio. Want to get fancy? No problem! Add these business phone system features to any plan for an additional fee. Vanity toll free numbers (e.g., 1-888-CARLOAN) can help your customers remember your number, your brand, and your value proposition. It's a simple yet powerful marketing tool for any business. Cost: $15 one-time fee. A true 800 number is the most recognized toll free number used by businesses since the 1960s. A true 800 number can add an element of trust and credibility to a small business who wants to look more professional. Cost: $99 one-time fee. You can add additional toll free or local numbers to your existing account at any time. You might want to use different phone numbers on your various marketing and advertising campaigns to track calls and ROI. Cost: $4.99/month per number. This feature allows you to record incoming calls which is great for training or quality control purposes. Call recording saves your recorded phone calls as audio files and stores them in your online management portal. Cost: $5/month. Call Blasting is what we call Simultaneous Call Forwarding. It allows multiple phone lines to ring at the same time, such as your home phone, cell phone, or other office lines. This reduces caller wait times and keeps you in continuous communication with your customers. Cost: $10/month. UniTel Voice offers low-cost/high-quality SIP trunking services for local & toll free 800 Numbers. We offer two plans: Pay-As-You-Go where you’re only charged for what you use and nothing more, or Committed-Use that gives you a discount on a special volume-based deal. Contact us to learn more. Don't need service but want to keep your number? UniTel Voice allows you to park, store, and save phone numbers, so you can activate them when you need to or port them to any another provider when you're ready. Cost: $5/month. Voicemail transcription converts your voicemails to text so you can read them on your computer or smartphone. This helps you quickly and conveniently get a voicemail message when you can’t listen to the recording. Cost: $5/month. An IP-phone is a physical desk phone that uses your internet connection to make and receive calls. It’s easy to set up and includes all the features of a traditional office desk phone. Cost: $9.99 per month, per user. Download a softphone and use your computer to make and receive phone calls with all the features of a traditional office desk phone. As long as you have a strong internet connection, you’re good to go. Cost: $9.99 per month, per user.